The 19th is your last opportunity to visit Lost Horizon’s Open House before it reverts back to a private region. Your personal limo. This is the first interior shot shared since completing the renovation, and it also happens to be the first room decorated once the landscaping was finished. The inspiration for the fireplace insert I borrowed from a photo Hap shared with the Apple Fall Group. 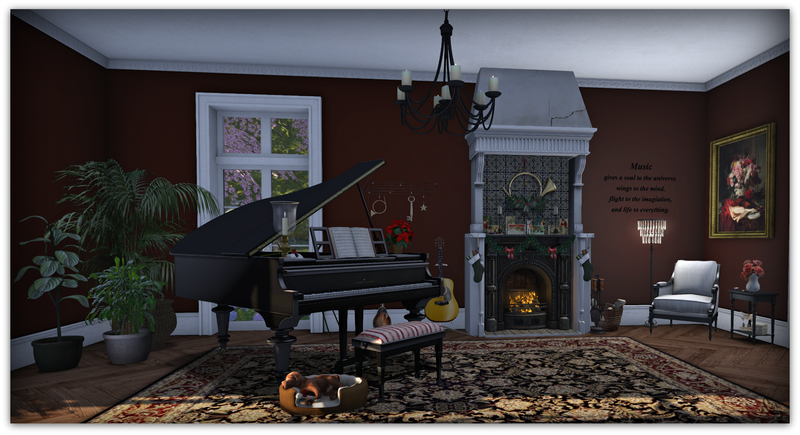 It was strange as I was a bit frustrated experimenting with prims to make a custom insert for the Apple Fall Fireplace when she shared her flickr link. Thank you Hap. Credits will soon follow as I plan to do an in-depth shoot of this room after the holidays. In the meantime, if you have a question regarding the decorating please feel free to contact me.